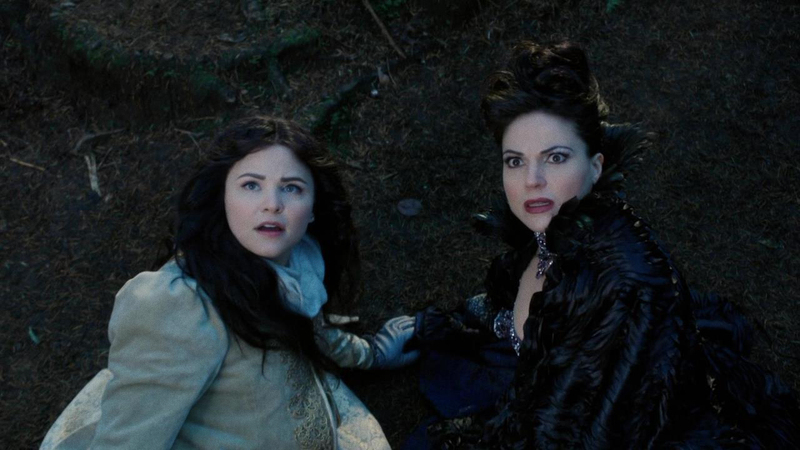 Can the Evil Queen be Forgiven? The Evil Queen does not have the best track record. It’s the whole “evil” thing. 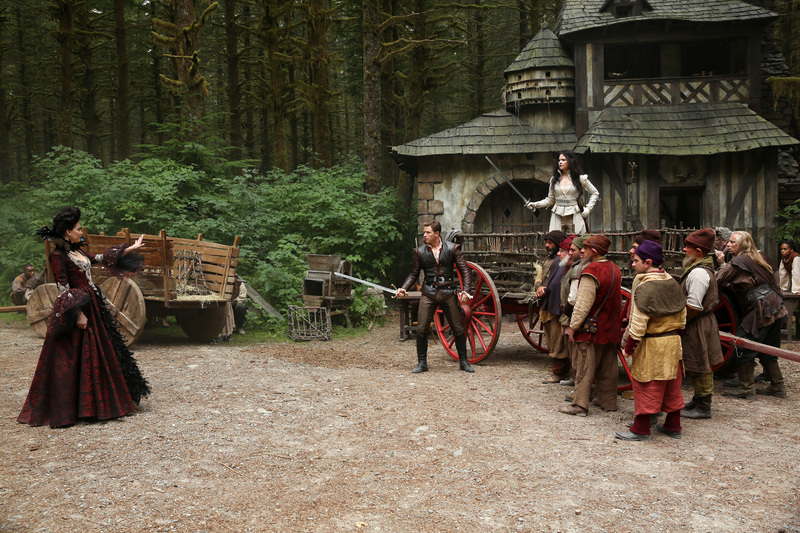 As she hunts Snow White, she questions the people of a town where Snow took refuge. When the people don’t give any information on Snow’s whereabouts, she has them all killed. So is this woman, able to murder an entire town without a second thought also able to repent? Is it still possible, after all this brutality, that she can let go of evil and embrace love, selflessness, and kindness? When trying to get information from villagers doesn’t work, the Queen, also known as Regina, has Rumplestiltskin put a disguising spell on her, one she cannot change without his help. She goes throughout the kingdom, disguised as a peasant, looking for Snow. After the Queen gets herself into a pickle, nearly being beheaded by her own guards, Snow saves her life. Since Regina, still disguised, has an injury that needs time and attention to heal, Snow conceals her in the woods and nurses her back to health. The Queen is surprised to find Snow so kind to a stranger. As the two women get to know each other, the Queen guides the conversation to herself, specifically fishing for Snow’s opinion of herself. She’s shocked to hear Snow say that she still has some good in her. As the conversation progresses along with the Queen’s health, the two women walk on to evade the Queen’s soldiers . Regina seems close to repentance, to wanting to make things right with Snow and be a family again. She’s drawn to the kindness she sees in Snow. Just then, they stumble upon the village that the Queen had visited earlier in the episode. Now, Snow is seeing people who cared for her in a mass open grave, all murdered by the woman she had just been expressing faith in. She changes her mind and says, “I take it back. It is too late for her. I could never forgive her. There is no good in that woman. None. I was wrong. There never was.”1 Surprise, surprise. The Queen chooses to remain Evil. More than once, a town sides with Snow White. Regina was going to repent; she was going to stop being the Evil Queen because she saw that Snow was kind and loving. More specifically, she realized that Snow loved her and would forgive her. The hope of family, love, and acceptance dawned on her and almost drew her to repentance. But then, Snow saw the depths of evil that this woman could do and in her shock and grief, her open hand of acceptance snapped shut. Really, who could blame her? The Queen had just killed an entire village. But God is not like that. From scripture we know that “the kindness of God leads you to repentance.”2 He knows the depths of our sin, yet He loves us anyway. Nothing we do surprises Him, nor will He be caught off guard like Snow White. As the prophet Isaiah says, “though your sins are like scarlet, they shall be as white as snow; though they are red like crimson they shall become like wool.”3 God is not looking for the good in us, but He promises to purify us. Will they ever be reconciled? All photos Copyright by ABC and other respective production studios and distributors. Intended for editorial use only. I also can’t help but to compare this to various contemporary protest movements across the political spectrum, where a premium is placed on being “on the right side of history” and denouncing an evil of some sort. I certainly get that there are times when we really do just need to witness against an act of injustice, but the absence of a reconciliatory element always kind of disturbs me. I’m not sure I have a ready answer for that. I hadn’t thought of the parallels to Herod, though now it seems annoyingly obvious. In Snow’s defense, when she denounced the Queen, she didn’t yet know that she was actually talking to the Queen. And she was speaking in shock and grief. However, if you read just her denouncement, it is rather brutal. What Snow said seems natural in the situation, and I don’t know that anyone could fault her for it. However, what she said did have an effect: the Queen no longer considering repentance. I actually had to look up the episode to see if the original air date was around Christmastime. I was actually a bit surprised when it wasn’t! I haven’t seen the episode yet, but just from your description, I agree that Snow’s reaction is brutal, at least from Regina’s point of view. That being said, though, I have to wonder if the queen wouldn’t have rejected the idea of repentance anyway, regardless of what Snow said. What I mean is that, Snow seems represent some source of external validation and forgiveness for Regina; yet, in order to truly embrace forgiveness and redemption, there’s a degree to which we must internally and honestly confront the wrong we have committed and be willing to repent and try to live our lives in a different way. It strikes me that, to abandon the journey to redemption, it’s not sufficient for someone to lose their external source of validation, but that they must also fail to honestly examine themselves and/or lose the willingness to repent. This isn’t to lay blame on Regina, per se. I’m actually coming at this from seeing this quite often in my own life: I’m usually pretty aware that I have spiritual shortcomings and faults at a high level, yet I find myself often too emotionally cowardly, spiritually tired, or intellectually dishonest with myself to truly get down to the details of what those shortcomings are and commit to repenting from them. Did you see some elements of this playing out at all during the episode? Or, if not, how do you think this would play out for someone in Regina’s position? Good questions, Mike! This episode and subsequent ones show the importance of accepting one’s guilt. During this episode, Regina learns that the people refer to her as “the evil queen”. At first, she feels slandered, but by the end of the episode, she embraces the name and the role. Fast forward to present day in Storybrook, Maine, she repents two episodes later as she remorsefully accepts her guilt. These episodes highlight two things we need to change: understanding that we are guilty AND knowledge that we are loved anyway.